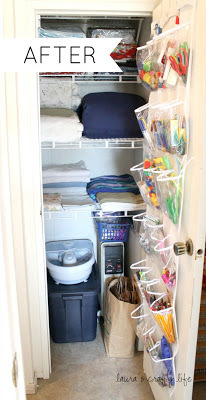 A while ago I organized my linen closet, but I never got around to taking pictures of it being finished. Then, life happened and it became a big mess again! So, I recently got it all cleaned up again, and I hurried up to take pictures of it while it was still pretty and nice. First up, I will show you the way before pictures. This was before I really did anything to it, other than just pile stuff up on the shelves. Warning: this is not pretty! 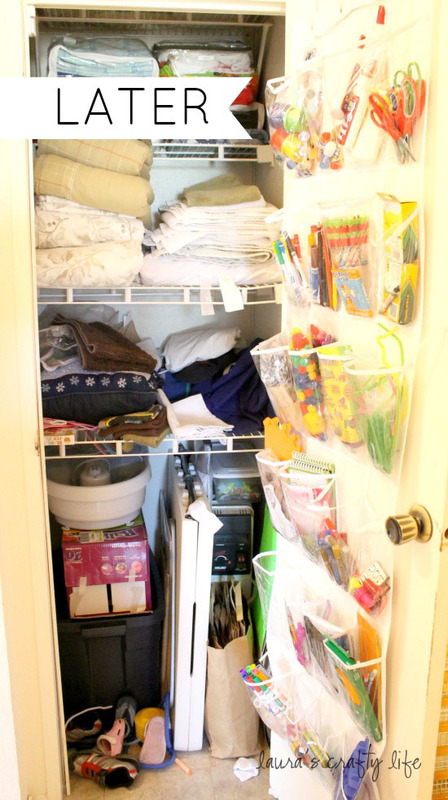 You can see the shoe organizer turned art and school supply holder hanging on the door. 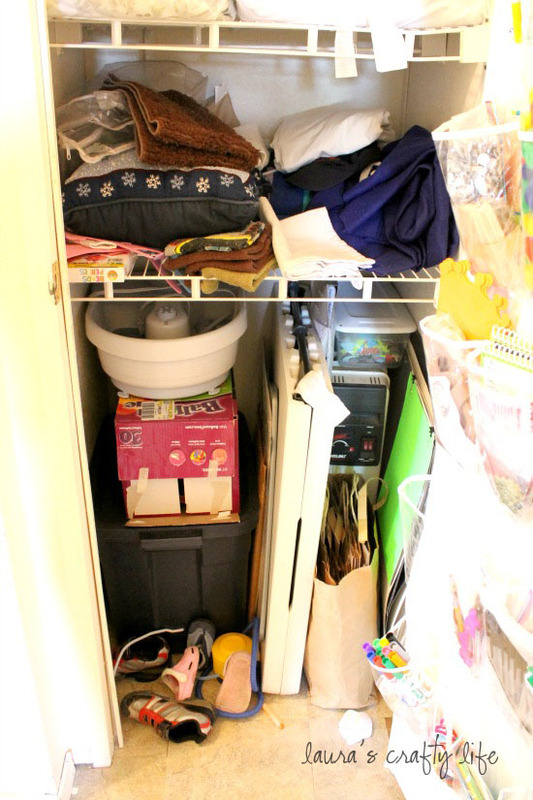 The rest of the closet is sort of a jumbled mess of crap all thrown in there. I store bed linens in there. I also store tablecloths, holiday towels, placemats and that sort of thing in there. We have an extra folding table, plus a storage tote full of backpacks and tote bags. Plus, some other miscellaneous items that don’t necessarily have a home anywhere else. Now you can see a picture of what it looked like last week. I had over-hauled the closet, but about 6 months had passed and a lot of items got tossed in there again. 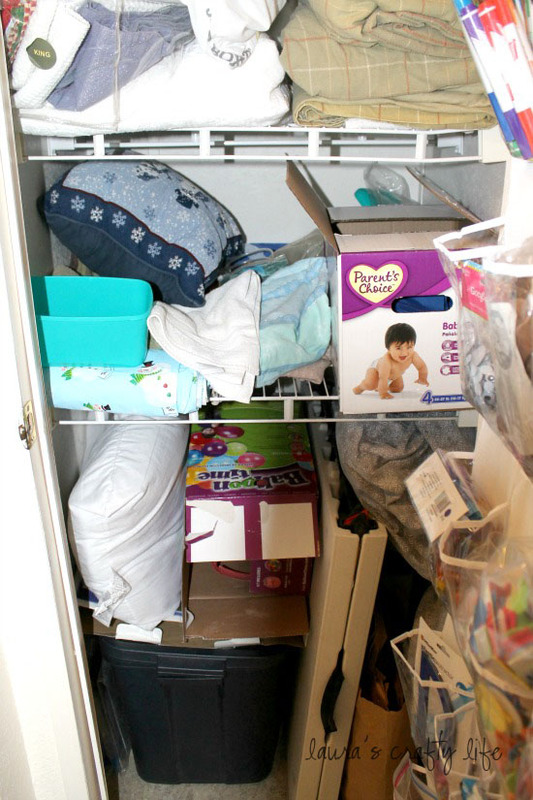 I was trying to store the kid’s outgrown clothes in there, but it ended up being a jumbled mess and things were not getting put back in the correct spot, so I had to move all of that out of there. 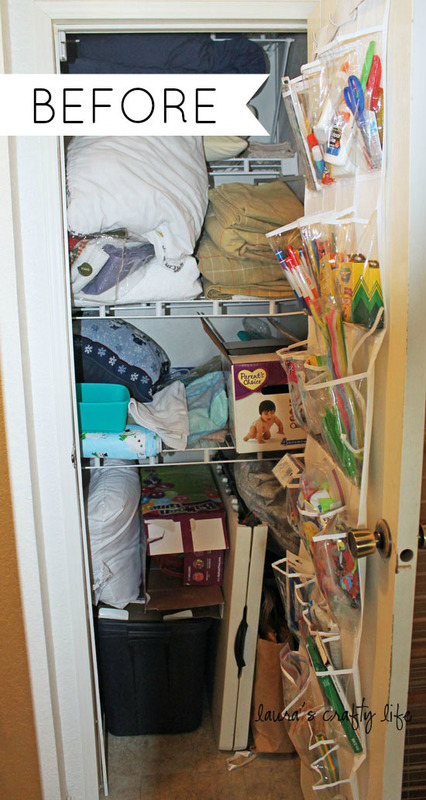 Below, you can see the bottom half of the closet up close. The bottom shelf was where the clothes were stored. This was just a few days after I had removed all the clothes. I knew I needed to re-organize this space! In this next picture you can see one of the changes I had made the first time I organized. 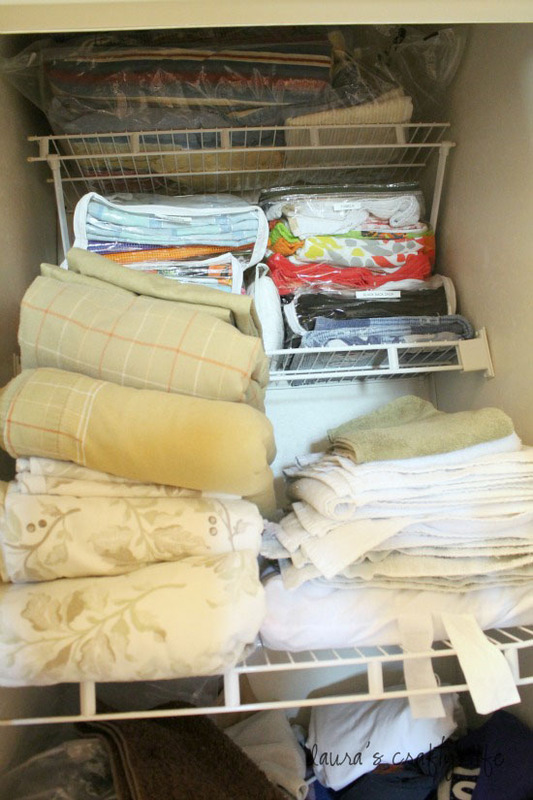 I categorized all the extra linens – tablecloths, holiday towels, placemats, etc. I used old plastic zipper bags that I had saved from purchasing other linens to keep like items together. I used my label maker to create a label for each one. They are all stacked up on the third shelf. When I finally re-organized everything last week, I pulled everything off the floor, and the bottom two shelves. I re-folded everything that needed it, and re-stacked all the like items together. If you need help folding your fitted sheets, I wrote a tutorial on it last year for the 31 days of deep cleaning your home series. And here is the closet all straightened out! 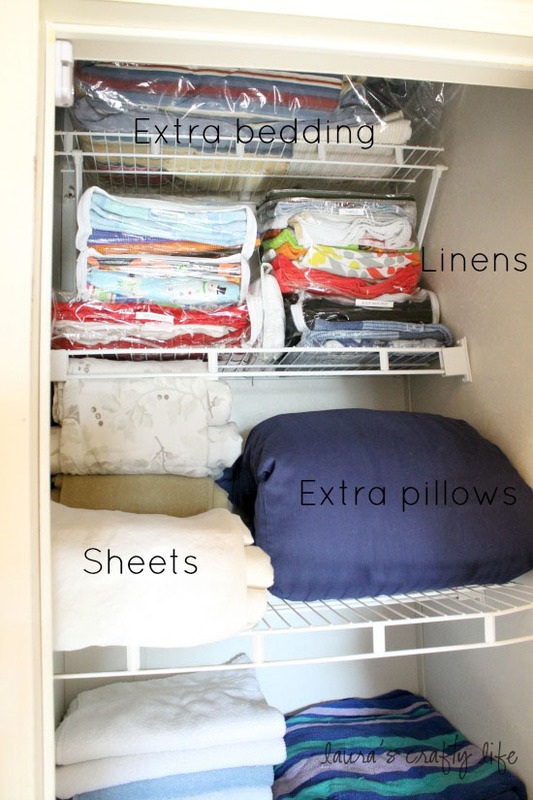 I am sure you have probably seen the organizational tip for sheets to fold them and put them all inside the pillowcase for that set. If you have king sheets like we do, you quickly realize this is a near impossible feat. So, instead, I fold the sheets and then wrap one of the pillowcases around the whole set to keep them together. In the next picture you can see the sheets stacked up neatly. Our linen closet isn’t huge, but it is very deep. 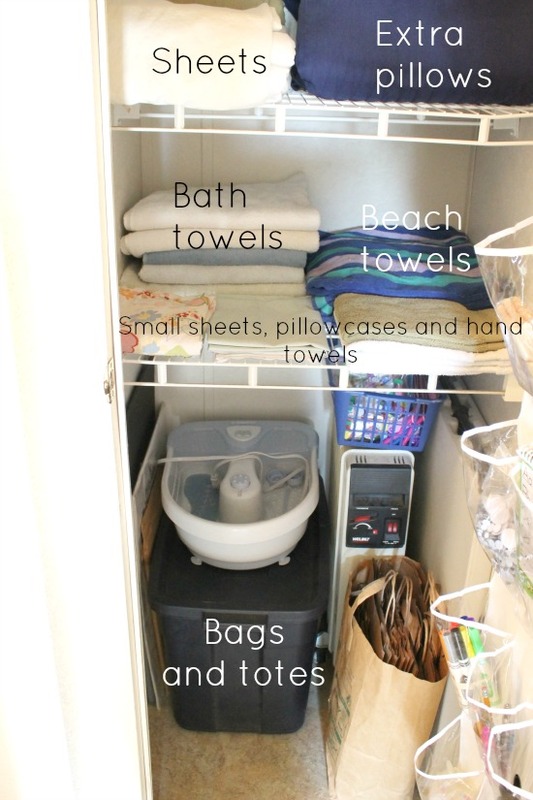 The best tip I can offer for you for a space like this is to layer your storage. If you put lower profile items in the front you can make full use of your space. You can also see the plastic zipper storage bags with all the extra linens in them. The very top shelf holds two bedding sets for our air mattresses. They are in Space Bags. Unfortunately, I have not had luck with them keeping out the air, but my main concern was keeping them all together, so this works fine for us. And now, just because everyone loves a good before and after, here are the two pictures together. The great thing about this, was I didn’t have to purchase anything new for this project. Just by placing like items together and straightening everything up, the space is so much more functional. 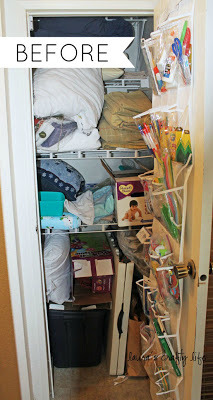 Having the kid’s outgrown clothes in this closet was not working. I am still trying to figure out a better solution. My benchmark for whether or not an organized space is really working for our family is if I can straighten the space in 10 minutes or less. If it takes longer than that, I need to re-evaluate what is working and what is not. Happy Organizing! Have you organized any spaces in your home lately?? Thank you for reading Laura’s Crafty Life! I found your blog via examiner.com while searching for information on creating an image gallery. I’m going to make time to sit down and try it. It’s the best tutorial I’ve seen so far! 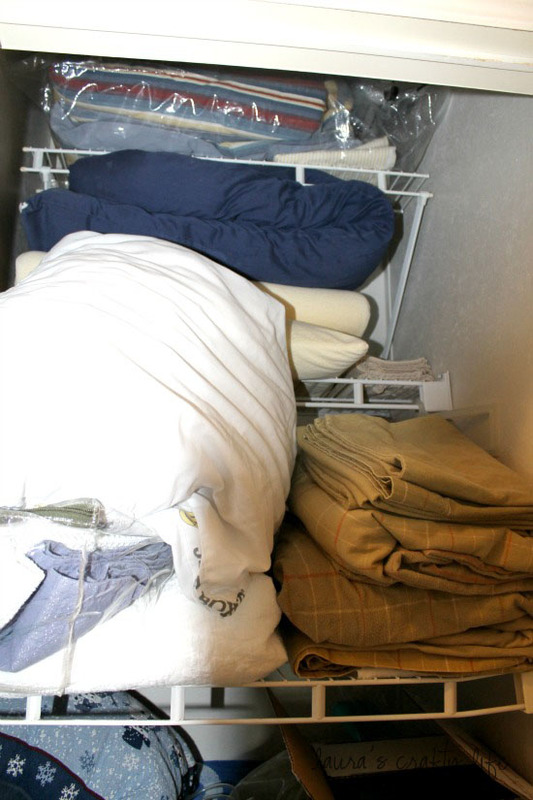 Your linen closet looks so good all organized. Mine is my nemesis! I am currently working on it. I really like your blog!